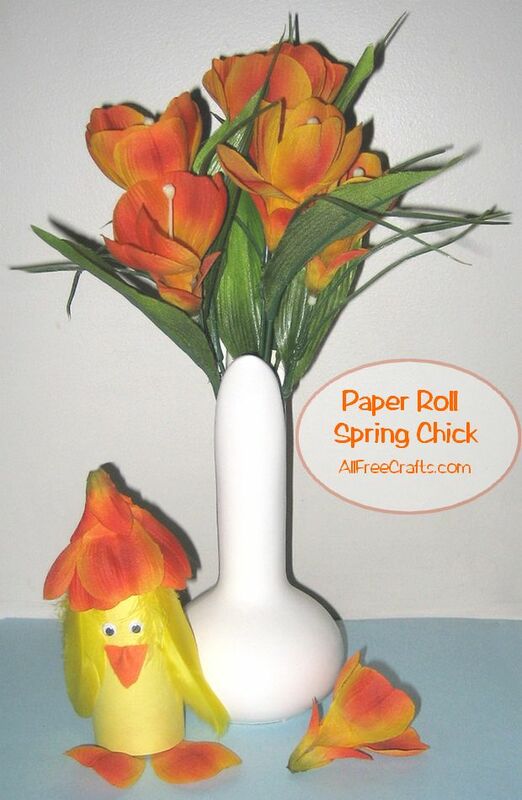 This spring chick is ready for Easter, hiding chocolate Easter eggs under a colorful tulip hat; it’s also an easy chicken toilet paper roll craft suitable for kids or grownups celebrating Spring or Easter. Toilet paper rolls covered in yellow construction paper with recycled Tropicana orange juice lids providing the footing. 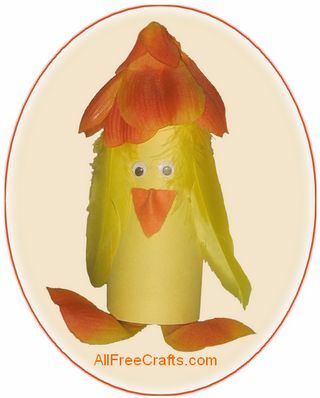 When I began making this spring chick, I was covering the toilet paper roll with yellow construction paper while also drinking Tropicana orange juice. The orange bottle lid struck my eye and looked like it would fit as a base. Well, it did. Perfectly. Even though I ended up making chick feet from tulip petals, I’ll now be saving Tropicana lids of this size. They would make excellent bases for many toilet paper roll crafts. Cut yellow construction paper to fit around the toilet paper tube. You can use a ruler to measure and cut, or just place one toilet roll end on the edge of the paper, mark with pencil where the other end falls, and cut a line there. Now you’ve got the paper cut to height, next roll it around the tube, overlapping the edges slightly, and mark again where you need to cut. Cut the paper to fit then apply double-sided adhesive tape all along one short end. Re-roll around the tube and press down on the tape to stick it down. Alternatively, apply glue to the toilet roll tube and press the paper into place over the glue. If you’re making tulip petal feet, you will also need a paper circle glued to the bottom of the roll to hold any treats. Trace a circle around the paper roll onto the construction paper. Cut out the circle and glue to the bottom of the roll. Place the paper seam at the back of your work. 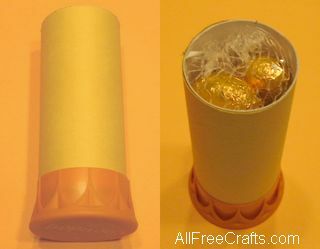 Cut a small orange triangle from felt, paper, or craft foam and glue it onto the front of the roll as a beak. Glue two plastic eyes above the beak. Glue a feather on each side of the toilet paper roll as wings. Remove two petals from a silk tulip and glue them to the bottom of the toilet paper roll to make the chicken’s feet. Remove the stem from another tulip flower. Turn the flower upside down and test fit it on top of the chick. Placing the flower on an angle gives the chick a jaunty look, but petals going straight down look fine too. To fix the tulip hat in position, you can use tape or glue. For gluing, just run a narrow bead of glue around the top rim of the toilet paper roll and set the tulip gently on top of the glue. For taping, stick double-sided adhesive tape all around the upper edge of the paper roll then gently press the tulip petals onto the tape. That’s it. Your spring chicken is ready to tiptoe through the tulips for Easter.